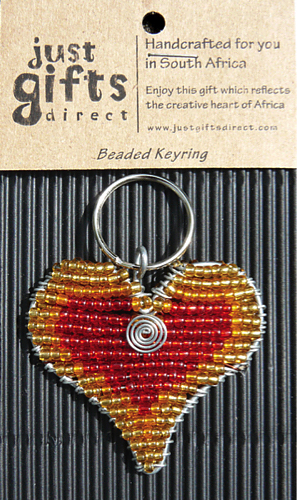 Handcrafted in South Africa, this stylish red beaded heart keyring will be perfect to put on your keyring sets or let someone know you love them. It is outlined in silver with a gold and red centre. It also displays the creative heart of Africa. Beaded Heart Keyring was published by Just Cards in April 2016 and is our 4363rd best seller. The ISBN for Beaded Heart Keyring is 5060427970558. Be the first to review Beaded Heart Keyring! Got a question? No problem! Just click here to ask us about Beaded Heart Keyring.